Are You Hosting a Velveeta Super Bowl Party? Still, I find Velveeta’s latest Super Bowl marketing idea interesting. Super Bowl Sunday is Velveeta’s biggest day of the year, as hundreds of thousands of Americans (perhaps tens of millions even) consume Velveeta queso dip with chips. And also on Sunday, 2,500 lucky women (out of 15,000 who applied) will host free house parties, courtesy of Velveeta producer Kraft foods. Trying to get more consumers to dip their chips into Velveeta, Kraft turned to House Party Inc., an Irvington, N.Y., marketing firm whose specialty is setting up parties to promote clients’ products. 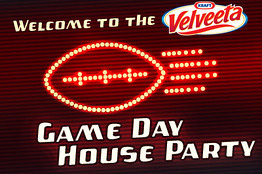 Using its database, House Party emailed Internet-savvy women ages 25 to 50, Velveeta’s target market, offering them the chance to host a game-day party featuring Velveeta. Both House Party and Kraft also promoted the offer on their Web sites. More than 15,000 women applied, and 2,500 Velveeta lovers were chosen. The hostesses, who won’t be paid for their services, get “party packs” containing a 32-ounce package of Velveeta, take-home plastic Velveeta storage containers for 16 guests, a recipe for chili con queso dip — along with the requisite cans of diced tomatoes and green chilies — a spinach dip recipe, a dip bowl, a couple of bags of Ritz toasted chips, snack-bag clips, Velveeta coupons, Kool-Aid and cups. House Party said it couldn’t estimate the value of the party packs. Kraft is doing this in the hope that people who sample the free Velveeta at these Super Bowl house parties “after sampling the product, will serve it regularly at home, as well as talk up its taste.” To that, I say, good luck. There are many foods that one might eat at a Super Bowl party that you simply can’t afford to serve every day . . . for the sake of your health. Kraft admits that sales of Velveeta are on the decline. However, the economy is bad, and it’s far cheaper than real cheddar cheese. So you never know. We are all especially price sensitive. Since I studied marketing when I earned my MBA degree (and while in business school I and three friends won a national award for our Rogaine advertising campaign), I think I have a better idea. Even though women are often the buyers of household cooking ingredients, a prime Velveeta target market is single guys. If I were Kraft, I’d look for men to host Velveeta Man Cave parties, with all kinds of quick foods and snacks using Velveeta, which are easy to make and which can translate into an every day after-work or lunchtime meal for a single guy. I don’t think the women’s house parties will do anything for Velveeta, since most women are already aware of the product and possible uses of Velveeta. Single men–that’s the ticket. In the past Kraft has been successful with Philadelphia cream cheese and Grey Poupon mustard house parties. Now, that’s a party I’d love to host. My wife is a Wisconsin (cheesehead) girl, so Velveeta is forbidden in our house. The generic name for velveeta-like products is cheese food. I often joke that it’s what they feed the cheese so it will grow up big and strong. My dad loved the stuff. We used to slice up a bunch of velveeta, grab saltines and ritz crackers and go eat them on the porch at our cabin. Then dad would get the hankering for some sardines, as soon as that tin was open I was gone. Sardines – yechh. Good times, though. If you like soft cheese, eat brie. Not only does it taste better, it is better for you. BTW, sardines and smoked oysters(kosher?) in a can are also good for you (fish oil and protein). I love them both. You’re absolutely right, Debbie, about it being better to let guys host the Velveeta parties. If the food is easy and tasty, the guys will continue to be customers. And most guys couldn’t care less about calories, while most women seem to be very focused on them. Perhaps the NFL is in on this, trying to get women interested in football? What do they expect the women to do, invite a bunch of guys to their house for a Superbowl party? Or perhaps ask a guy if she can host a party at his house? Doesn’t this put the woman in a bit of an awkward position? Oysters, clams and similar seafood that lack fins and scales are not kosher. Neither are fish with smooth skin, which includes parasitic fish like lampreys and hagfish and predatory fish such as sharks. I have never eaten velveeta to my knowledge. But then again sometimes when you get nachos who knows what cheese it is. My nacho cheese comes out of tin cans, but that doesn’t sound appetizing either. As for food concerns this a great blog. Called the BarfBlog, it is about food related illnesses. Very interesting and some hilarious comments on food in our society. I grew up eating Velveeta cheese, probably because it was all my parents could afford. But, as a man, I developed a preference for Tillamook extra sharp cheddar cheese, which I can’t get here in the Ol’ Soldiers’ Home, because our PX doesn’t sell it, and our mess hall doesn’t serve it. I never watch the Super Bowl, or any other football game on television. It’s boring, and puts me to sleep. Oh, I love football, but only if I’m playing, and at my age, I can’t find anybody to play with! I love being able to run and hit someone! So, I reckon I’ll watch the Puppy Bowl on the Animal Planet Channel. Debbie…Real Men don’t eat Velveeta. It looks like plastic once it dries out because it’s made out of plastic. Yuk! I LOVE Velveeta. Sadly, I never eat it. Haven’t had it in years….and probably won’t ever again, yet the taste is on the tip of my tongue. I’m sure it’s nothing but chemicals and salt. I couldn’t bear to read the ingredients. If I were really naughty, I could see myself living on nothing but Buddig processed meats and Velveeta ! Don’t even want to know what’s in Buddig. Ah well, those were the good ol’ days. Back to my soy milk and oatmeal forever more ! In reference to my previous comment, my FAVORITE thing to do with Tillamook extra sharp cheddar cheese is to remove all the wax covering, and let it sit exposed to the air. It dries out, darkens, and becomes very brittle, so you can break off little chunks and snack on them. I also enjoy slicing a thick slab of Tillamook extra sharp cheddar cheese and putting it on an equally thick slab of bologna (the kind you buy whole, and slice up yourself), between two slices of French bread, with some hot spicy mustard, and either eating it hot or cold. Oh, speaking of “hot spicy mustard”, – – – when I was a soldier in Germany, MANY long years ago, I used to buy bratwurst und brochen (i.e., “sausage and bread”) from sidewalk vendors, and it was served with a REALLY tasty mustard I’ve encountered ONLY in Germany. I don’t know what it’s called, but I haven’t had any since then, because apparently, it ain’t available here in the United States. I hated Velveeta as a kid–and hate it now. I never knowingly eat that garbage–and won’t. Keeping kosher protected you well in this case DS.